Ask Giantmonk #1: Where Art Thou From? “International Monk” caught my eye. Whose heart and creative hands built you and where? And who is Giantmonk? Giantmonk is me. Monk(monkey) Giant (I am a large monkey). Giant. Monk, cuddling chum extraordinaire. 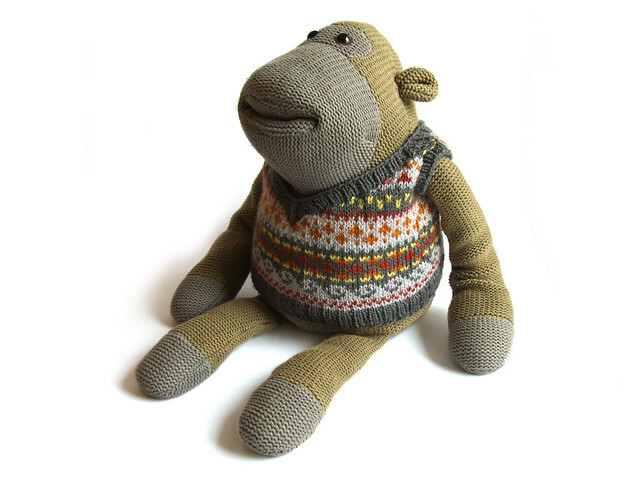 I am more than a mere few thousand knitted stitches and a curiously floppy arm alongside three more substantial limbs, I am best friend and confident to Mimi of Eskimimi Makes and Russell of Find It Cheapest. I found my way into their lives when I found out that Mimi was in need of someone just like me. You see, there was once another Giantmonk, who we now call ‘Cousin Giantmonk’ who lived with Mimi and helped her through difficult and sad times. He was a handsome chap, as you can see from the picture below. But a few years ago, Mimi had to leave Giantmonk behind and say goodbye to him forever. Mimi found this very difficult, and a year later she still missed the heavy knitted cuddles that she had, though she wasn’t sad any more – she wanted someone to share happy cuddles with. 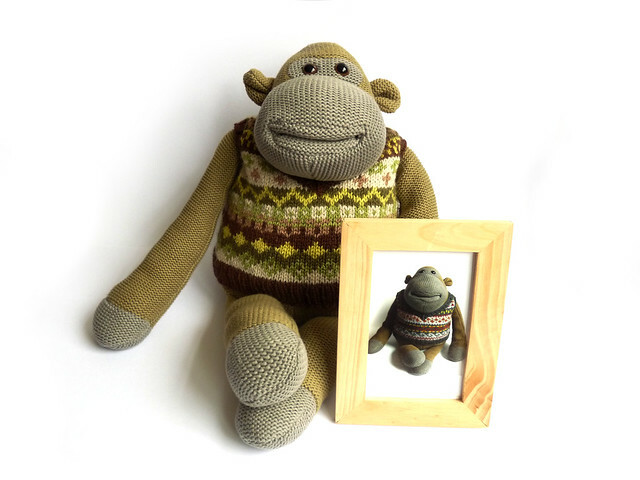 So Russell sent out a long search to try to find someone who could give cuddles as good as Cousin Giantmonk, and after a couple of interviews and a rather gruelling obstacle course, it was decided that I was the monkey for the job. The first thing I did when I arrived with my tiny suitcase was to request my uniform fitting. I had seen the lovely tank top that Cousin Giantmonk sported in the photos I had seen and had assumed that I would be required to wear one of my own. Mimi laughed and said it wasn’t mandatory, but I wanted one! So we picked out a few colours, and soon enough I had my own tank top. And that’s how I came to stay. You also asked by who’s fair hand I was made, and the truth of it is, I do not know. I have a tag on my shapely bottom that says something about Basildon, Essex, UK, but I think I came from a big room full of like-shaped cousins… my memory on this is really fuzzy. To ask Giantmonk a question of your own, on any subject under the sun, from Japanese kissing fish to bubble bath choices, visit the Ask Giantmonk page.